Every Saturday men — from high schoolers to 80-year-olds — meet in the locker room of the Columbus Crusaders, the youth sports ministry in central Ohio. Called 222 Men’s Fellowship, each session begins with a short video, usually featuring Mike Stanley or Brian Elder, the executive director of the Crusaders. Then participants gather in small groups and discuss the video or share what is on their minds and hearts. The videos are based on Stanley’s ‘Manhood Language’ resource and the same CHRIST acrostic used by the Crusaders: Commitment, Honor, Responsibility, Initiative, Service, and Truth. A favorite verse of Pastor Ed Jackson, Stanley’s mentor, was 2 Timothy 2:2. For Stanley, the verse contains the essence of what men need to do for other men: entrust Biblical principles to each other. Those videos are now available for use by anyone in a small or large group study or for personal use. Sharilyn Stanley, Mike’s wife, notes that whether a speaker is great or unrelatable, one thing men need is the opportunity to talk with each other. 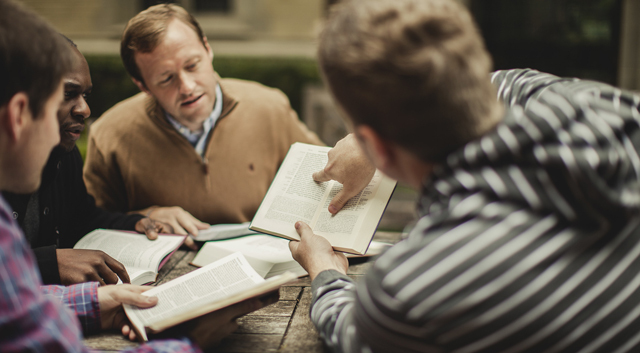 Mike Stanley makes it clear that the 222 Fellowship is not just a Bible study; there is biblical teaching, but the bulk of the time is men talking to each other about life issues. In 1996, Stanley and Mike Cheeseman, both members at Grace Polaris Church, a Charis Fellowship congregation on the north side of Columbus (Mike Yoder, lead pastor), were challenged during a sermon by then-pastor Jim Custer. Custer encouraged the congregation to combine the things one loves to do for recreation with a love for Jesus. The result was the youth-focused Crusaders football program. Two years ago, Stanley and Cheeseman decided to build this new ministry, reaching an older audience of men. Stanley says that the program can be easily adapted for other groups. The format is simple and a great resource for leaders who are unaccustomed to planning such sessions. Stanley encourages them to take advantage of the videos found on YouTube. “Someone can use these videos free of charge and have a 222-type men’s group where they discuss the videos after they watch them,” he adds. Stanley stresses that meeting to share experiences and learn should not be hindered by recruiting a speaker or finding the perfect location. 222 Men’s Fellowship, like any gathering, is based on people’s natural gifts and personal desire for growth. He says that building and encouraging other Christians can be like the 222 meetings: gathering and sharing with one another. [Connect:] Click here to send a note of encouragement to Mike Stanley.